Last year, I had an adult (a voice teacher in fact) come to me for lessons on how to sight read better. She was an amazing singer, and could easily accompany herself and her students on the piano by playing chords, but found it difficult to sight read, even pieces at the grade 2 level. This year I taught two adult students with a background in music (had lessons as a child or in high school band) who want to re-learn the piano or learn how to play their favourite songs. Finally, I’ve had transfer students who had an astounding ability to memorize the sounds of the pieces but struggle with playing new material that had not been demonstrated before. What do these learners have in common? They are all weak in their SIGHT READING. Sight Reading is the ability to play written music on your instrument of choice without having seen it before. Why should I learn how to sight read? Today’s pedagogues and musicians agree that the ability to sight read is of the utmost importance. Anyone who have played in a group/band can tell you that if one person stops to correct a mistake, this will throw all the other members off. Furthermore, wouldn’t it be incredibly freeing and exhilarating if someone could “plop” any written piece of music in front of you, and you could pick it out right away? Why is sight reading such a challenge to most musicians? Sight reading is like reading a book, except you are expected to read something and play the instrument at the same time. Many musicians attempt to sight read material that is too difficult, and end up simply “decoding” the music (imagine how a 5 yr old sounds out words in order to read). This is not reading. The fact is most musicians devote their time to practising their technique and repertoire, but allot very little time and energy to developing their sight reading ability. Furthermore, as a teacher, it may be difficult to cover technique, repertoire, theory, ear training and sight reading in a 30 min session. Studies have tracked the eye movement of skilled sight readers and they have found more eye movement, especially ahead in the music where they are playing. Conversely, poor sight readers tend to look exactly where they are playing, or backwards. This skill of looking ahead is what everyone who reads books can do. When you are reading a sentence, your eyes are automatically scanning what is coming ahead (if you don’t believe this, open a book and cover the last part of the sentence you are reading. You will likely be able to say the rest of sentence). How do I become better at sight reading? Pros: Gives you time to preview the music. When you play the music, you have the option of using the metronome, which keeps the beat to help YOU keep going. This is an excellent teacher when you don’t have one. Pros: You can select the difficulty level, and arranges the notes systematically so you can easily learn how to read all the notes on the staves. 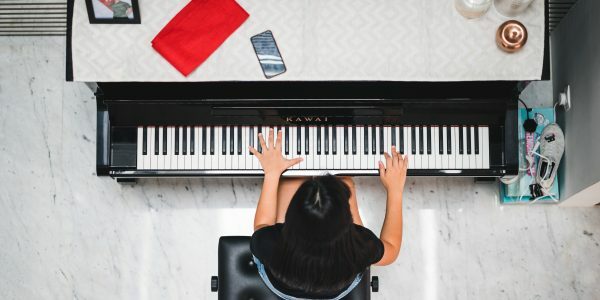 The app picks up on the sound you produce from the instrument, and the notes fade away once you play them, which gives you immediate feedback on whether you played the correct notes or not. It also rates you on your ability to play the rhythms accurately (gives you a gold, silver, or bronze on your attempts). Good for beginning students. and its “Tap that Note” allows you to practice reading the correct note when you are away from the piano. Cons: The sight reading excerpts are either treble or bass clef so you don’t get the chance to play music hands together. It is a bit simplistic for students above grade 2 RCM level. In Part 2, I will mention material (books) that you can look into for sight reading material, as well as tips on how to pick the material that’s RIGHT for YOU. 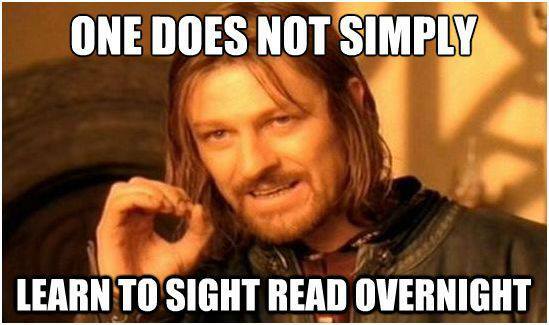 Part 3 will be about what good sight readers do, and the GOLDEN RULE OF SIGHT READING.